Mr T is working in Scotland at the moment, so Friday nights we celebrate his homecoming with lamb curry and naan bread. These are easy to make, so I’m sharing the recipe with you so you can impress your friends – and wow your kids – they love watching the breads puff up like magic! Lightly whisk the yoghurt into the water, put all the dry ingredients in the bread maker and add the water mix, followed by a knob of butter. Use the dough setting and allow the bread maker to do it’s work. Take the dough out of the bread maker, put it in a bowl and cover with a damp cloth or cling wrap. Leave to prove for an hour or two (Or, you can do as I do and make the dough the day before and put the dough in the fridge over night). When you are ready to cook your breads, set the oven to its highest setting – and do the same with your grill – both need to be HOT. Put a baking tray in the oven. Break off pieces of dough, the size doesn’t matter, it’s personal taste how big or small you like your naan breads to be. Take the baking tray out of the oven, place the flat breads on the tray and return to the oven for about 5 minutes or until they have puffed up. Then move the tray to the grill to brown the breads and serve straight away. 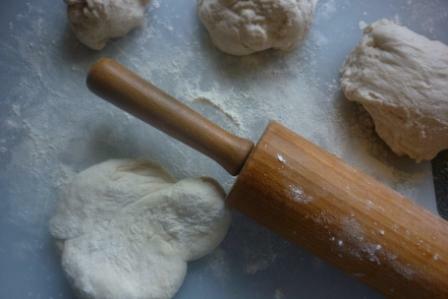 You can flavour your naan breads before rolling out, just knead your choice of flavourings into the dough. In our house we like to add plenty of garlic and coriander. Served cold, these taste great dipped into home made hummous.